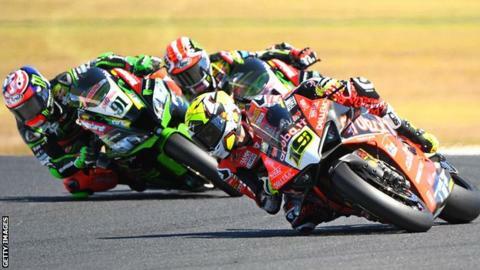 Jonathan Rea finished second in the first race of the 2019 World Superbike Championship in Phillip Island as series newcomer Alvaro Bautista won. Bautista, 34, riding a Ducati, became the first rider to win on his debut since Italian Max Biaggi in 2007. The Spaniard passed defending champion Rea on lap one of 22 and raced clear to win by 15 seconds, with Marco Melandri third on a Yamaha. The new 10-lap Superpole sprint race and race two will take place on Sunday. Northern Irishman Rea, 32, was beginning his bid for a record fifth straight World Superbike title. Former 125cc world champion Bautista has made the move to WSB after nine years competing in MotoGP. England's Carl Fogarty is the only other rider to have won the championship on four occasions after his triumphs in 1994, 1995, 1998 and 1999. Kawasaki's Rea and Englishman Alex Lowes battled for the runner-up spot for much of Saturday's race after long-time second-placed rider Leon Haslam crashed out, then restarted to finish 15th. Melandri came through from ninth place to third, as Lowes was edged into fourth after a thrilling last lap battle which saw the Italian pass at the penultimate corner. Lowes' team-mate Michael van der Mark was fifth, breaking away from a battle behind between Toprak Razgatlioglu and BMW-mounted Tom Sykes, the Turkish rider taking sixth by 0.2 of a second. Sandro Cortese came home eighth on his WSB debut and Welshman Chaz Davies went from 16th on the grid to finish 10th. Eugene Laverty was 12th on his first competitive outing on the new Ducati Panigale V4. Leon Camier crashed unhurt at turn two after an early dice with close friend Davies.